Shiraz is located in South central Iran has been a cultural capital of Persia for more than 2000 years; it is the gateway to the UNESCO world heritage listed ancient ruins of the Gate of Nations area, including the 6th century BC city of Persepolis. 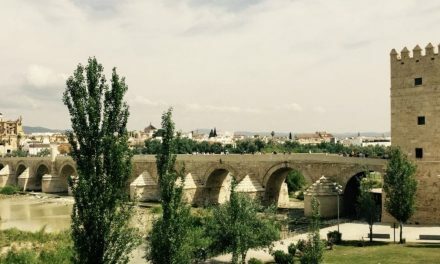 Iran had been a controversial place to travel amongst our family and friends before we left and we were a little nervous on arrival as we did not have visas to enter the country and were not sure what the process would be. We flew into Shiraz from Dubai with a subsidiary of Emirates Airlines, FlyDubai. It was a very pleasant one hour flight and we were warmly greeted by a friendly Iranian gentleman, keen to tell us all about his country and home town. We had been informed that the Iranian people would be very hospitable and keen to know what we (Westerners) perceptions of Iran are and this gentleman was both of those things, polite yet curious. We followed the other traveller’s to the visa office and after a short wait we were given paperwork to fill out, paid the fee of 290€ each and headed off to passport control where a visa was pasted into our passports and we were free to go on our merry way. We had to exchange US Dollars for Iranian Rial on arrival as the Iranian currency is a closed currency, which you can read more about here. Travelling to Iran had taken some planning and we had booked our accomodation in Shiraz some months before arriving. The owner of the Parhami Traditional House, had provided us with directions, written in Farsi to give to the taxi driver and before we knew it we were being whisked away into the traffic. Our first taste of traffic in Iran was, well, frightening is quite an understatement. For those of you who have braved the roundabouts in Paris and Rome, you ain’t seen nothin’ yet! Chicken is the national sport of drivers here. Everybody pushes in and the maddest, who in this case was clearly our driver, wins. Slamming on brakes, flooring the accelerator, hooning around four lane roundabouts where the lanes, where visible, are little more than a suggested guideline. Pulling out into the face of oncoming traffic, squeezing through lanes where there was no earthly way to fit. This drive had it all! We eventually made our way to our hotel, down some streets that were not wide enough for a car but the driver made it fit and total cost? $6 AUD. Parhami Traditional House is located 90 metres down a labyrinth of alleyways, in the Vikali area of Shiraz. 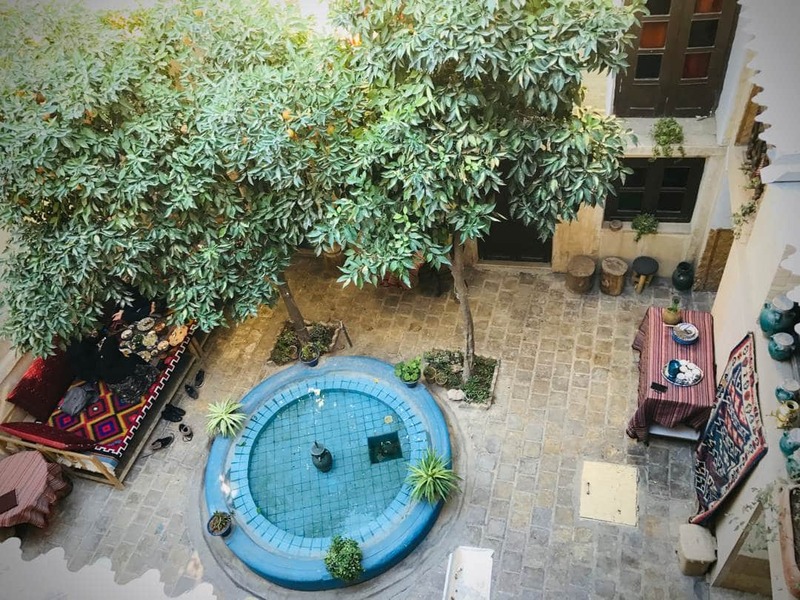 The house built in the traditional Persian style, is a mud brick, 250 year old home with a beautiful courtyard, filled with orange trees, fountain, tables, chairs and couches for lounging. It is quite famous in the city not only for accomodation but also as restaurant. As we write this blog we are excited to find that Parhami Traditional House, now has a website and if you look closely in the images you will the Possess the World team in there. Feeling excited about finally arriving in Iran, we stashed our bags and were off to explore the surrounding streets but not before our hosts insisted that we share saffron sweetened tea and caramelised Persian dates with them, in the garden. As we wandered the streets we appeared to be the star attraction, everyone wanted to say hello, especially children of primary school age. They are all keen to practice their English skills and welcome you to Iran. 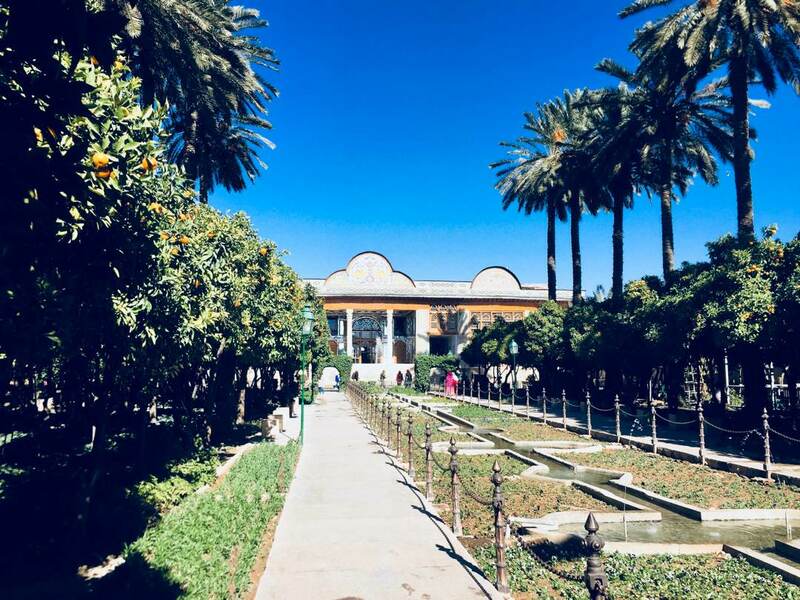 We visited the Qavam Gardens and Museum of Antique Objects, before grabbing lunch from a friendly fellow called Ibrahim, who introduced us to the Persian pronunciation of Kebab, Charbob and talked us into not one but 2 with bread, roasted tomato and taro salad. All to take away from his very small shop. And the price, $3AUD for both of us. Kebab in hand we set off back to Parhami House, where our host displayed yet more Iranian hospitality and added to our lunch with with a sour milk drink flavoured with mint called Door, and some pickled vegetables, Torshi Makloot, which we were informed is always had with Kebab. We could get very used to this sort of hospitality. In the evening as the call to prayer rang out across the city, we headed out to discover more of the local area. Not yet game enough to leave the area around our accomodation, as most signs are not in English and the winding roads and lanes were dark, we headed off down the main road. What was a relatively quiet retail street during the day had become a mass of lights, colour and people of all ages. It was Thursday night, the equivalent of Friday night in the west and it seemed the whole city had decided it was party time. 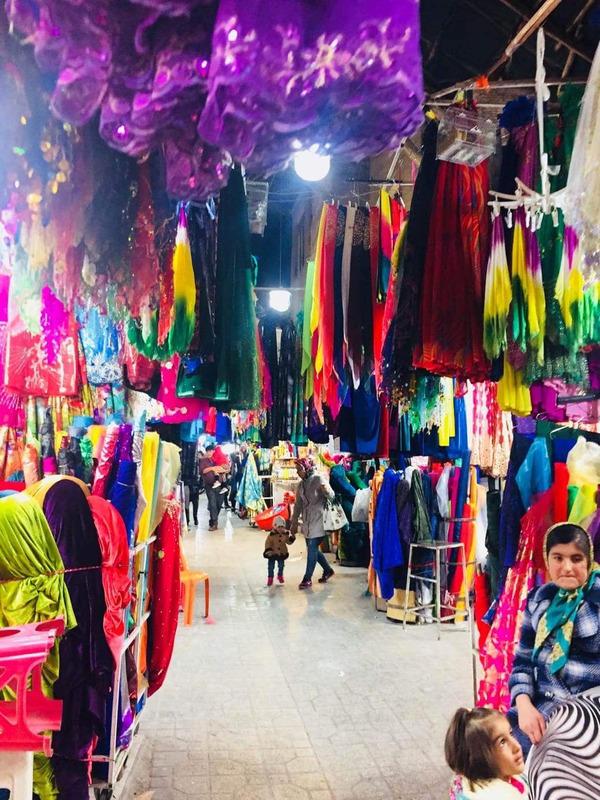 The Vakil Bazaar, is centuries old and it is a riot of colour and people. The fabric stalls go on for row after row, it is a technicolour dream of fabrics with intricate hand stitching, beading, lace and silk . Clearly under the Chador there is some party dressing going on! Spice shops, jewellery shops, leather goods, glassware, pottery and every imaginable food stuff are available and it seems the whole of Shiraz is here to buy it. Alleyway leads into alleyway at any and every angle and in no time we were hopelessly lost. But then a left here and a right there and we popped out into the street where we started. Amazingly we managed to find our way home, ready for a traditional Iranian dinner and it did not disappoint. We have realised at the end of day one that we need to sharpen our appetites whilst we are in Iran, these people can eat! It was an early to bed night, as we needed to be up and ready to go early for our day trip to the UNESCO listed Persepolis and the Gate Of Nations. 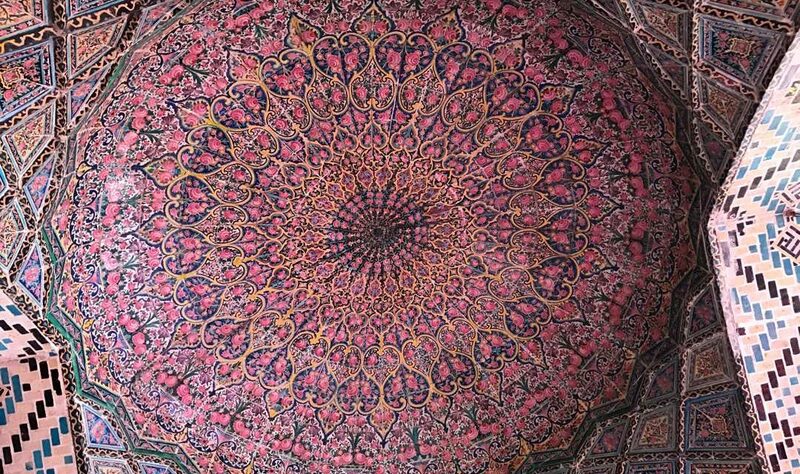 On our third day in Shiraz, we were feeling pretty confident about navigating the city and were up and about early to visit Nair ol Molk Mosque, better known as the pink mosque. Perhaps we were a little over confident as we found ourselves not at the pink mosque but at Shah Cheragh– an Imam’s mausoleum. We entered through separate doors, where Cath was presented with the chador and introduced to our guide, a very pleasant and knowledgable young woman. We were unable to enter any of the buildings as we are not Islamic but were able to marvel at the beauty and serenity of the huge square and intricately carved and mosaic covered shrines. After wandering in the square closely observed by our guide, we were invited to have tea and look at some pictures of the inside of the buildings. Here we met an official looking gentleman who was clearly a representative of the ministry, he was actually quite interesting and very happy to discuss the issues facing Islam today and throughout history but also very keen to reassure us that Christianity is very much a part of life in Iran and that we are all people believing in similar gods and prophets. We were left thinking that more conversations like this may in fact be very good for our troubled world. At the end of our chat our guide took us to the gate closest to the Nair-ol-Molk mosque and gave us directions. We found the entry to the mosque quite easily and were instantly knocked out by the beauty and peacefulness. 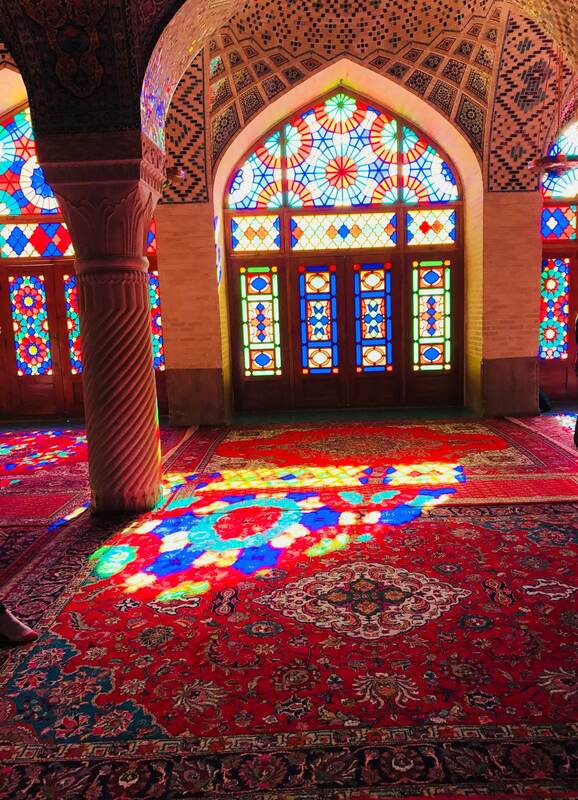 The stained glass is actually quite simple in design but the design of the walls, roof and carpets create the most beautiful colours. It felt like being inside a kaleidoscope. The area where you view the pink room is actually a small square and room at the back of the Mosque and we had to find our way through the alleys, to the front where the prayer rooms are located. Again the chador was required and separate entries for men and women. We were left wondering why all the other women look so elegant and Cath looks like she is wrapped in a bed sheet! Everyone we met along the way was very friendly and super interested in an Australian visiting a mosque in Iran. The prayer rooms were breathtaking in their decoration, mirrors everywhere, cut to reflect all the light from every surface, this must be what being inside a diamond is like. Unfortunately there is no photography allowed. A quick stop off to get some Persian sweets and we were off in search of Valisar Square. But we got lost and never found the square but we did find our way back to the Bazaar. We grabbed a bite to eat from a street vendor, which turned out to be a spicy vegetable pastry, a bit like a Cornish pasty and headed home for a well earned rest. In the early evening we caught a taxi across town to the Tomb of Hafez. Hafez is a revered Persian poet and philosopher, his works can be found in nearly every Iranian home. The tomb and the surrounding gardens were first erected in 1452 and along with the tomb and gardens there is an art and crafts gallery, school and market located at the site. We were again mobbed by a group of school children all wanting their photo taken and to practice “hello, how are you? where are you from?”. So very cute. We learnt an enormous amount about Iran, current politics and the feeling of people talking with the taxi drivers on the way to and from the tomb, again being struck by how different our perceptions can be compared to the reality. We had another fabulous meal at a traditional tea house and restaurant, Saray-e Mehr, located inside the Bazaar before an early night in preparation for our trip to Isfahan. 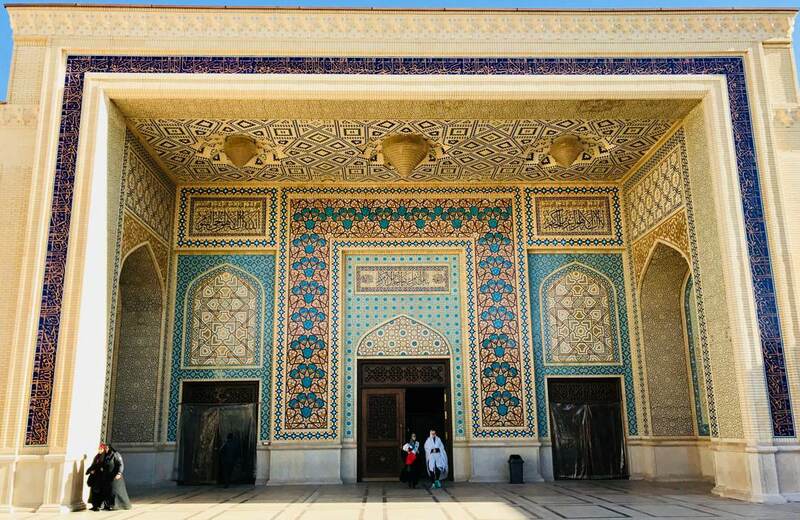 Want to see more images of our travels in Shiraz? Head over to the Possess the World Instagram account. Did you enjoy this information? Share it with your friends and family using the Social Media buttons below. Please leave us a comment below if you would like more information or just want to give us some feedback about this post. I love these patterns, spectacular colors. I’m in awe at the intricacies and detail of the architecture! I’ve always had a fascination with going to Iran. Was it a safe experience? 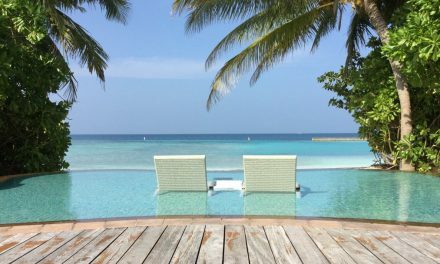 Great post, loved to read your experience throughout the trip. Personally, I didn’t get to visit Iran in the past due to all the news on TV and radio, but I’m now enlightened to know that not everything is real. I met an Iranian girl and sometimes I visit her and she cooks so amazing dishes, I will just want to visit for the food experience and it will be more than enough for me. Hi Katie, thanks for your comments. Shiraz is so much colorful place. You have written it so nicely that I literally had walked around the place while reading. I can only imagine how fantastic these dates must have tasted like. The iranian hospitality is only one of the reasons why I would love to visit the country one day. I already heard a lot about the beauty of Shiraz as a friend of mine studied there for 1 year. She adored the country as well. Hi Amelie, thanks for commenting. We hope you can travel to Iran, maybe with your friend? Very interesting article! Iran..wow, what an amazing adventure. The culture you all were able to experience must be almost overwhelming. Very happy to hear that people of Iran were nice and inviting. Loved this. I am so blown away by the colors and how much detail there is in everything. Its remarkable how beautiful the country is and I wish I could visit!! Hi Nicki, thank you for reading and commenting. We hope you can visit Iran, what is stopping you? I didn’t get to visit Iran last year due to the news but I’m now enlightened to know tgat not everything in the news is real. Iran’s cuisine sounds yummy. I’ll love to try. And the pink mosque, I’ll love to visit. I remember I saw a pink pineapple last year in a village in Japan. I’m yet to compile my travel destination for the year, I might as well add a 3 day trip to Iran. I love how colorful everything is! It looks like such an interesting place full of wonderful things to experience and explore. 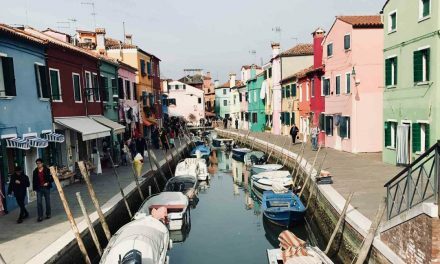 Such a colorful place! I feel sad when places are like these are not high of travel list. I would definitely love to visit. However i feel 290 euros for visa fees is too much. Would love to see some food photos and know the dishes. Hi Ketki, keep an eye on the blog for more information about the food we ate whilst there. The visa was really high but we think it was worth it to visit some amazing places and to experience the Persian culture. The Nasir Ol Mosque looks so beautiful. Hope you enjoyed your trip to Iran. Loved reading all your posts. This is amazing. Did you find any tensions when you were traveling? (As americans, maybe our experience would be different?) I would love to go visit but I’m a bit nervous, especially with bringing my little one along. I LOVE that first photo – gorgeous ceiling. Thanks for sharing all your posts – it’s fun living through it – espeically for the ones we might not be easily able to visit. Interesting read. Iran sure seems like a nice place to visit. I will like to see all the people and colors like on the Thursday night you described. 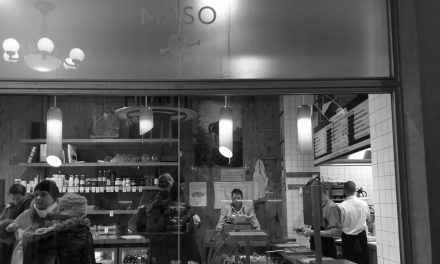 Great post, loved to read your experience throughout. That’s weird – my friends didn’t need a chador on top of the usual headscarf when we visited Nair al Mulk last year and in February. I’m also surprised by how much you had to pay for VOA in Shiraz. Hi Nicholas, thank you for your comments. As non muslims visitors to sites in Iran, we were happy to be respectful and comply with the local customs. All visitors were required to wear the chador on the day we visited. I remain amazed how effortless the local women make it look. The price of VOA appears to vary with the country you are from, were you travelling with an Australian passport? We were (and we still are) on Singaporean passports. Perhaps prices and rules have changed further. The ladies did wear the chador at the Shah e-Cheragh and the Imamzadeh-ye.